Wed., Sept. 6, 2017, 8:33 a.m.
KOLKATA, India – The Vatican on Wednesday declared Mother Teresa a patron saint of the Archdiocese of Calcutta at a Mass in the city where she dedicated her life to the poorest of the poor. 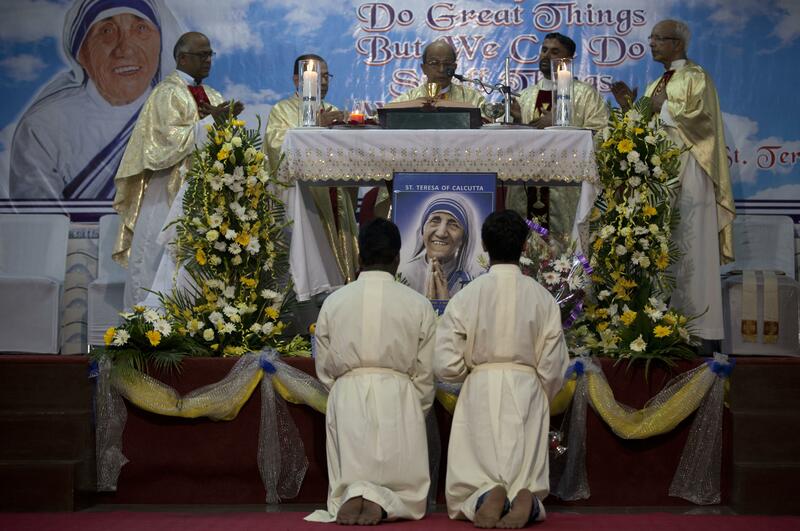 The honor came 16 months after Pope Francis declared Mother Teresa a saint. About 500 people attended the Mass at a cathedral where Vicar General Dominique Gomes read the decree instituting her as the second patron saint of the archdiocese. Mother Teresa’s name will be mentioned whenever people under the archdiocese pray or a Mass is held. The Vatican’s ambassador to India, Giambattista Diquattro, led the Mass and inaugurated a bronze statue in the church of Mother Teresa carrying a child. The archdiocese still retains its old name, Calcutta, even though the city’s official name was changed by the state government to Kolkata in 2001. “We are very happy that Archdiocese of Calcutta has declared her as its patron, acknowledging her great work for the people,” said Sister Prema, the head of Missionaries of Charity, the order of nuns started by Mother Teresa in 1950. Catholics in Kolkata said they were delighted with the Vatican’s decision. “We are very happy that our Mother Teresa, who has done so much service for the poor and destitute in the city, irrespective of religion, caste or creed, has been made the patron of the Archdiocese of Calcutta,” said housewife Karabi Kanjilal. Published: Sept. 6, 2017, 8:33 a.m.